With five separate cooking options, the Cuisinart; Griddler; can handle everything from pancakes and sausages to grilled cheese to steaks, hamburgers, and panini. 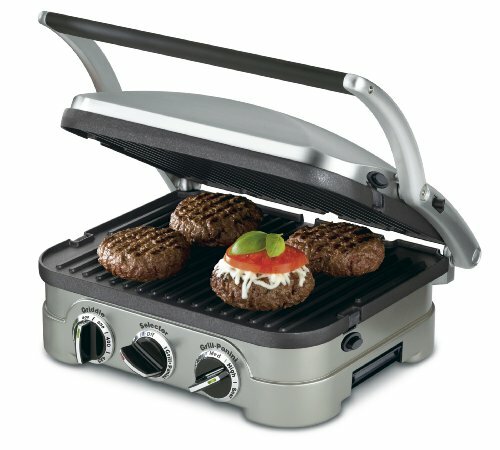 A floating cover and one set of reversible plates turn the Griddler; into a contact grill, panini press, full grill, full griddle, or half grill/half griddle. Dual temperature controls ensure everything is perfectly cooked every time on the removable dishwasher safe nonstick cooking plates for easy meals and clean up. Removable and reversible 11" x 9" dishwasher-safe nonstick cooking plates drain grease for healthy cooking into the integrated drip tray. Please refer to the Product Video and the User Manual before use.